Your hands get cradled in comfort by the Comfort Wave Design - Wave + Curve + Palm Rest. 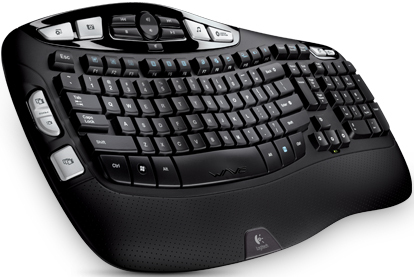 A wave shaped keyboard with a cushioned palm rest - puts you ahead of the comfort curve without the learning curve. Curve Appeal: A comfort curve without the learning curve. Your hands get cradled in comfort by the Comfort Wave Design - Wave + Curve + Palm Rest. Cushy Cushion: When you’re not typing, the cushioned palm rest will help make your hands happier. Powered Packed: The three-year battery life is so hassle-free you just might forget it uses batteries at all. Wave Shaped Key Frame: Your fingers vary in length. So with its gradual wave-shaped contour, this keyboard supports the actual, varied lengths of your fingers. Learn more about how Logitech created the Comfort Wave Design. Three Year Keyboard Battery Life: The extended battery life means you won’t spend your time tracking down new batteries. Big on battery life? We are, too. Logitech Unifying Receiver: The tiny receiver stays in your notebook. Plus, you can easily add a compatible wireless mouse or keyboard - without the hassle of multiple USB receivers. Learn more about the Unifying receiver. Advanced 2.4 GHz wireless: So you can work or play in more places like your comfy couch the long-range wireless connection virtually eliminates delays, dropouts, and interference. Learn more about Logitech wireless technologies. Constant Curve: The curved profile has a familiar shape and consistently sized keys, so you can type with comfort and confidence without relearning how to type. Cushioned Contoured Palm Rest: The palm rest helps position your hands comfortably on the keyboard and offers a comfortable place to rest your palms when you’re not typing. Adjustable Keyboard Height: Three options for leg height allow you to adjust the keyboard to the height that feels most comfortable to you. Instant Media Access: Convenient one-touch controls give you instant access to volume and media playback. A dedicated button starts Media Center. Programmable Keys: You are in charge with programmable F-keys you can easily customize to open your favorite applications, folders, or Web pages. Shortcuts? Hot keys? Programmable buttons? Find out more about SetPoint software. Internet connection or CD-ROM drive.